It's still early Spring in east Tennessee. Today is cold and brisk and a reminder we're only at the end of February. "March out like a lion" is still to come but traditionally, or at least from 25 years of living in these parts, we're due another good snow in March offset by some very fine weather the rest of the time. Any snow won't last. Today, I noticed my daffodils in the flower bed are decidedly ready to bloom and on campus I saw a tree full of Cedar waxwing. I can remember not too many years ago we had deep snow the Friday before Spring break that cancelled flights in and out of Tri-cities for three days or so. Really messed up a bunch of students' plans to fly south and escape this crazy weather. By the weekend at the end of break, I was on the road to Blacksburg and you'd never known we had a foot of snow except for the downed trees. After March, we have had the surprise Spring snows. Our neighborhood lost power for a week in one of those freak storms but the overnight lows never got below mid-30s. It was more like camping inside than anything else. Campus stayed open so I could go in and warm up and get some hot water. I used my camp stove to make soup. I read a lot. Went to bed early. It was very eerie with the power off just how quiet the house is. You don't appreciate that until all the motors and gadgets beep their first breath again. Spring might get here. Eventually. Maybe by June? Maybe by September? So far, for 2010, we have had record-breaking snows but not record-breaking colds. I’ll take the snow, thank you, you can have the bone-chilling cold. By my reckoning, we’ve closed campus for any number of reasons, every week except one, since before Christmas which means we’ve been off some hours for the last 6-7 weeks. I’ve been there 20 years and this has never, ever happened before. 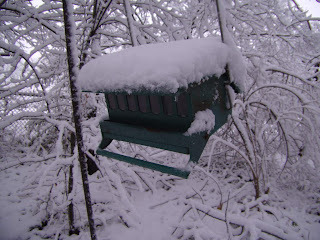 The ground feeders (mostly doves) have the hardest because the blowing snow will re-cover seeds. Scattering seed will help but I always figured the squirrels would out wrestle the doves for those seeds. Try as you might, you will contend with the squirrels but they’ll contend with the cats. In addition to feeding is some access to water. This is the one thing I haven’t mastered. I suspect, in the neighborhood, there is plenty of water and since our ground temperatures don’t usually get below freezing, water is available in many different places that I probably wouldn’t even notice. This is not something I or anyone should take for granted. The animal life needs water just as we do. I keep thinking that some day I will coax a swampy part of the my copse into being, for water in the winter and frogs in the summer. Shelter is available year around, of course, in the bird houses but I’ve seen photos of mixed species gathering in large cavities for warmth. At the feeder, I’ve noticed the smaller birds don’t crowd each other and usually are just waiting for the few seconds it takes to dive to trough, grab one seed, and go. The cardinals like to sit on the bar and scoop out seed and then go to the ground to feast. For an interesting article on avian feeding smarts, read that same Discover Magazine for March 2010 as I mentioned above.